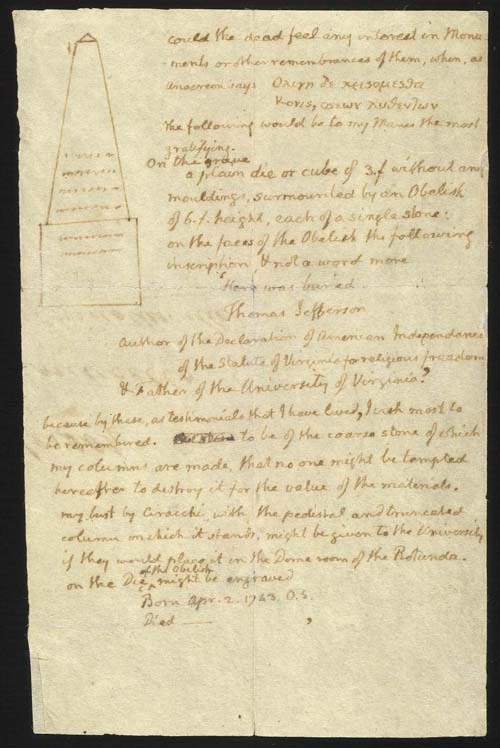 Jefferson’s Epitaph, Education and the Enlightenment Republic – Rethink. A friend asked about the linkage between American government and education: the United States is an Enlightenment country certainly, and we definitely make claims to be a meritocracy. But as any reader of this blog knows, Enlightenment came at the expense of ancient and medieval thought, and the sciences in an almost wholly practical sense can be advanced by commercialism. It isn’t clear that we should have schools, and in fact, education in the law itself – knowledge of how republicanism itself is supposed to work – is left an almost private matter. The structure of our government and the political science it rests on are products of Enlightenment; but what of actually trying to make an enlightened people? Right away, you can see that “Author” and “Father” are different roles, two different types of creation. An author looks to be a creator whose work is fixed and final; America declared independence, Virginia established religious freedom. A Father creates also, but there is nothing fixed or final about that enterprise. There’s a progression in the list – we move from declaring independence, to establishing our own law for freedom’s sake, to exploring and perhaps knowledge itself: the New World is perpetually new. Both freedom and knowledge are universal in that they benefit all men, and that is maybe how “Author” and “Father” complement each other: nowadays, we only think of right negatively, what government doesn’t restrict. A “right” for us involves the right to become an alcoholic or curse loudly at public officials. But the truth is that one is only free inasmuch as one can act with knowledge: if you act without knowledge, you usually find some way of hurting yourself only, and it isn’t clear that you have exercised freedom as much as found restraint. “American Independence” and “religious freedom” in Virginia are by themselves pointing to universality, but it looks like “university” is most emphatic on that matter. Thomas Jefferson, in his time and to our greater benefit, was then and today a profound renaissance intellectual. A well educated seeker of truth and justice that has sustained us and this country to this day. He was fortunate enough to exist among peers of like kind and philosophy comparable to the ancient greeks. They were, however, responsible to effect the government and rights we hold so dear today. Love it or lump it. They also were genius in the fact that they left room and process for improvement. Our new president is ultimate proof that their futuristic perspectives have not only survived but have been proven much to the chagrin of the IGNORANT.